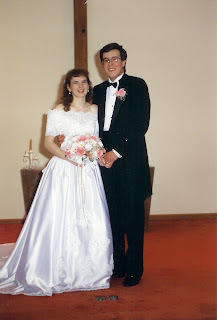 He Holds My Right Hand: Seventeen Years and Counting! The last time we visited David’s parents, his mother told me she is so thankful David had found a wife (Me, of course!) who could “put up” with his quirks. She meant that lovingly, though. She wasn’t putting him down - no, not at all. She truly loves her son and wants only the best for him. But, at the same time, she is his mother and realizes he does have some behaviors that can be a bit peculiar at times. Her mention of this was to emphasize the fact that I am someone special to David, and to her, and she was glad the Lord had brought David and I together. I, too, am thankful the Lord has brought us together. I truly love my husband with all my heart, and I’m so blessed to have him for my husband. We've had a lot of good times over the years, and have shared many of life's ups and downs. He's not perfect, and neither am I, but we are learning and growing together. My life would not be the same without this man. He is kind and caring, has a heart for God, is a GREAT teacher and loves to teach about the Bible (especially about our free gift of salvation), is a GREAT Paramedic, is great at keeping track of our expenses, and is a loving and protective father. He has taught me so much, and has helped to make ME the person I am today. The kids love him, I love him, and our lives would not be complete without him. Thank you, David, for being a special part of my life! Thank you for sharing the last 17 years as my husband. I look forward to many more!